This page describes formulas you can use to transform a column of data into a table of rows and columns. This transformation can be done with a single formula entered into the cells in which you want the two dimensional table to appear. This page will present two formulas, one simple formula for use if your column of data has a fixed number of elements, and a second formula, an enhancement of the first, for use if your column of data is variable in size. As an example, assume that your column of original data begins in cell B4. (In the image above, cell B3 contains the (optional) header Column Data and the actual data to be transformed, shown in colored fonts, begins in cell B4. The data in both the original columns and transformed tables are shown in colored fonts for illustration purposes. In practice, the color is entirely irrelevant.) Next, assume that the first cell of the transformed table (not including the Tablular Data header) begins in cell F4. 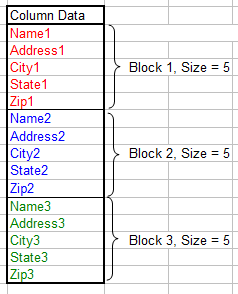 Since the data in the original column of data is grouped into sections of 5 rows, we use a defined name called BlockSize with a value of 5 in the formula. You can use a defined name as in this example formula, or you can hard code the number within the formula itself, or you can reference another cell. All that matters is that the block size somehow gets into the formula. Enter the formula above into cell F4 and fill across row 4 for 5 columns (or the number of columns equal to the block size of your columnar data). With this formula now in cells E4:J4, fill that range down so it fills the range F4:J9. This range has 6 rows, but the column of data has only 3 blocks of data. Thus, the remaining cells in F4:J9 are filled with 0s, as shown below. This is most likely undesirable, which leads us to the second formula presented on this page. This formula is split in to two lines for clarity, but should be all on a single line on your worksheet. The reverse of these operations, transforming a table into a single row or a single column, is described on the Table To Column page. You can download the file with all the example formulas on this page. In addition to the formula approach described above, you can use VBA code to automate the transformation of a data column to a two dimensional table. The code below will transform a column of data that has a defined name of ColumnData to a two dimensional table, the upper left cell of which has a defined name of StartTable. The block size of the data in the column is specified by the C_BLOCK_SIZE constant.
' the data in ColumnData is specified by C_BLOCK_SIZE.
' cells with element N of ColumnData. You can download the file with all the example formulas and VBA code on this page. This page last updated: 11-November-2008.